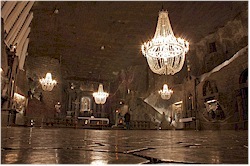 Wieliczka and the salt mines: one-of-a-kind underground wonder. At only a stone's throw from Krakow, deep under the earth is located one of Unesco's deepest heritage sites: the Wieliczka salt mines. Discover the world beneath and be astonished by the artistic marvells that have been carved out of the salt by the miners during the several centuries that the mine has been in operation [read more about it]. Krakow (or Cracow) is considered as one of the most beautiful towns in Europe and most likely is the most touristic place in the whole of Poland. This becomes cristal clear when you walk through the old town center: you cannot miss the tourist trains, horse carriages and touroperators that are ready to receive all those thousands of tourists that visit it daily. Because the town was miraculously spared from destruction during the Second World War, it maintained its historic character. It has been listed on Unesco's World Heritage list since 1978 [explore Krakow].